After more than a year since the JotSpot acquisition, Google finally launched a service that uses JotSpot's technology: Google Sites. The new service is a part of Google Apps and allows you to create web sites collaboratively. "People can work together on a Site to add file attachments, information from other Google applications (like Google Docs, Google Calendar, YouTube and Picasa), and new free-form content. Creating a site together is as easy as editing a document, and you always control who has access, whether it's just yourself, your team, or your whole organization," explains Google. Google offers templates, a rich-text editor, 10GB of storage for each Google Apps account and integration with other Google services so you can embed gadgets, calendars, spreadsheets, presentations, photo slideshows and videos. 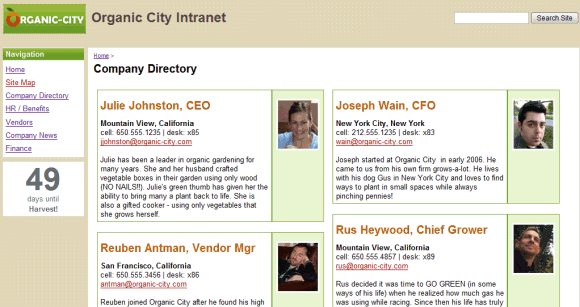 You can invite people to collaborate or just view a site and you can also publish the site so that anyone can view it. VentureBeat likes the new service. 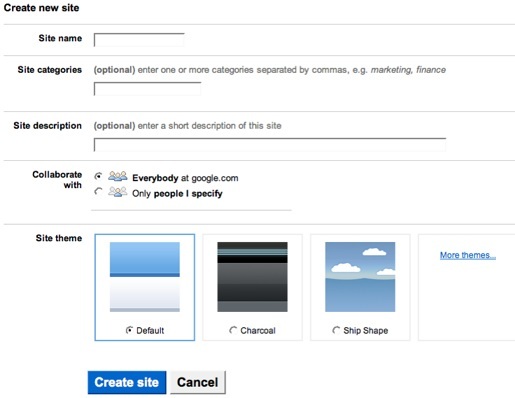 "Creating a new site with Google Sites is very easy. (...) You can start out by creating a front page for your site and from there decide whether to add more standard pages" or use one of the built-in templates: dashboard, blog, file cabinet, list. Webware notices that Google doesn't offer too many features. "As is typical for Google productivity applications when they first launch, the functionality inside Sites is on the spare side, but the collaboration features are clear, easy to use, and well-chosen. This is a capable workgroup wiki, and even in this early stage its integration with the Docs and Apps suites makes it an excellent collaboration tool." 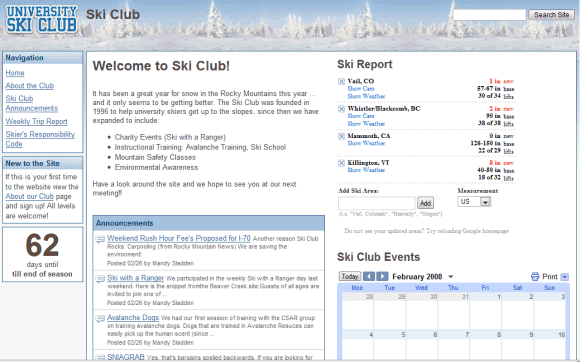 Here are three examples of Google Sites: a company intranet, a ski club site and a team project. The new service is enabled by default for all the new Google Apps accounts, but administrators need to enable it explicitly for the existing accounts. I've given Sites a try and it looks as easy as using Blogger. As usual, Google is 'starting simple' but there'll be more to come I'm sure. We've used Blogger for a community organisation which doesn't have a lot of web expertise but Sites may be the way to go for collaborative content generation. Meanwhile, I'm wondering if there's potential for a 'family intranet'. I've noticed today that the Google Document "File" menu has been extended and the "Save", "Save & Close" buttons removed. I haven't checked this out yet. Aside from collaboration, is it very different from Google Pages? Any more ability to use HTML? So will this be a total replacement for the Google Page Creator which hasn't seen an update in about a year? I can't log in with my gmail account. Is there any usage for users without a domain? yah, do you think this will replace goodle page creator, or is it something that is completly different? if it does replace GPC what will happen to the pages already made? All your sites are belong to us! Do you think this will be rolled out to regular google accounts or will it remain inside the apps product. Would be nice to be able to use this collaboratively with friends/family like i was with jotspot before. I can't find any reason why Google Sites shouldn't be available for all users. The service replaced Page Creator in Google Apps, so it's likely that Page Creator sites will be migrated to Google Sites at some point. Looks like it's not being rolled out to individual accounts anytime soon. It's too bad too, because it seems like this creates the app that I wish Google Notebook would be. 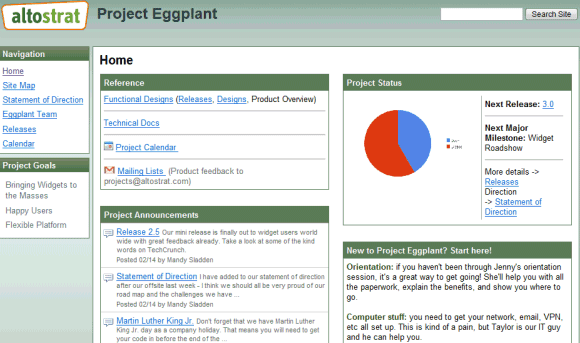 A Personal Wiki or dashboard portal for all the google apps. Thanks for the feedback - its a real shame if they do keep it separate. I assume that would be a differentiation strategy of some sort however even apps is essentially 'free' so i cant see how that translates into a significant revenue driver. After using Google Sites for a while I posted a review. Anyone who is interested is welcome to comment. I feel that the opportunity for a truly useful application has been missed, and Google Sites represents a fine starting point, but the terrible integration killed all usefulness of the application. I've also given Google Sites a try. Looks simple and nice. Pretty much like Blogger. I'm wondering if there will be social networking options. That would be awesome. "Thanks for your interest in Google Sites. We agree, and are actively working to make Google Sites available to our consumer users." What I did not yet clearly understand is whether Google Sites is a replacement for the Page Creator, meaning I can use it basically for creating my primary webpage of my Google Apps domain or whether it is just a tool to be used for collaborating with others (inside a company,etc.)?? You can use it for both purposes, the same way you can use Google Docs without collaborating with anyone. From what I understand, Page Creator has been removed from all the new Google Apps accounts. It was just an easy way to create web pages without learning HTML, but it didn't have useful features like: revision history, collaboration, comments, hierarchies (directories), powerful controls, password-protection. So far Google has an absolutely pathetic "Table" system. Play with it a bit and try to put pictures, etc in it. Also, try to align them... You're in for a world of hurt. You'll eventually just give up on it (as I did). Instead, just use the HTML view to program it yourself (and hope that Google doesn't try to change your code). I know how frustrating it is to create tables the "google-way". It is the same inside Google Docs or in Page creator. It doesn't really answer my question: How to give access to the wiki or "google site" to users who do not have google accounts? Is it possible at this date 12/31/08 (at least 9 months after the question was first raised)?? If it is possible, how does one do it? I've authorized people to share and I've invited them . . . how rude if they can't do it UNTIL the sign up for a google account. I hope to hear back from you soon. It would be really embarrassing to discover that I've invited my friends to a party they can't attend unless they subscribe to google. Can anyone have mercy to explain to a complete blond how can I use the templates? GPC is much better than google sites. I have created a site in google for searching for a job.Its simply superb. I've also given Google Sites a try. Pretty much like Blogger. I'm wondering if there will be social networking options. That would be awesome. Looks simple and nice. I`m so too! Just put up my first Google Site. Everyone should have a site. I am wondering how long before the Google crawler gets around to finding my low volume site. It seems to me that this Google initiative appeared not so successfull as others. Does anyone know of this can be good for traffic and seo? Wery simple and wery powerful sistem! Google rulezz! Sites page editor sooner or later will not load. helpers' recommendations, but they generally will not work. If you're lucky you'll receive a pop-up survey wherein you can beg for help getting your page editor to load, which typically does get someone's response. After a couple edits, it won't load again. As to whether the Google team responsible for this is somehow so long unaware of how systematic the flaw is, or whether this is a project built on top of some sort of irreparable early flaw (not quite the same as a system grafted onto someone else's system,) I would guess the latter, because so many people have been clamoring for help with their editor loads for so long. My experience has been on a reasonably powerful computer, well protected. All your sites are belong to us! !! In case, if you not able to handle Yahoo email issues then don't take tension, just call us toll-free Yahoo Customer Service Number and get in touch with our experts. Are you unable to reply mail in msn? Do you have issues related to the internet connections? If your answer is positive, then simply first of all try to fix the issue by yourself. In case you are incapable of fixing the issue by yourself, just dial a toll-free phone number of MSN customer care support service. The phone number is the right choice to attain the exceptional tech support solutions. You can give a call on the number anytime to attain the utmost tech support solutions. The phone number is active round the clock to provide the exceptional tech support solutions. We used to get so many mails in a day; it could be 0 to 1000s mails in a day. Your Yahoo account will be filled with so many mails and you want to get rid of the old mails which you don’t have any use. There is a technical complication here, as you can’t delete your all mail in a single run. This is to help you avoid any misfortune when you accidentally deleted all mails. The idea is simple; you can either use filter for all mail before a certain date or you can delete them by using CTRL > Press A; it will delete multiple emails. If you looking how to forward your yahoo email to another email address account, Now you can check out our blog for steps to forward your email to another email address. Steps to change password in gmail account for iphone & ipad. Change the regualarly your password it is very difficult to hacker to use your account. If you change regularly password then you can safe using your gmail account and also safe your email & contacts and important things. Follow the steps how to change. Outlook is one of the most popular email client applications, but sometimes a difficult one too. Microsoft introduced Outlook to use your email communication by configuring it on your computer or mobile device. This is a common problem when your Outlook mail server becomes non-responding. There could be any reasons, among these for this situation. You just wanted to get in to your Yahoo email account, but after entering the user name and password; this Temporary Error 1 : UserOpenFailed flashed on your computer screen. What could be more annoying that getting this temporary error when you have correct email address and password, but couldn’t sign in.